Looking for the best value for your money ? This is your suit! High value and supreme looking wetsuit line with good stretch and most features of the top end lines. All you need for a great day on the water. Made for a broad spectrum of recreational windsurfers and kiters looking for a comfortable, quality product with a reasonable price performance ratio. - Seal_Tite Collar: single layer collar construction for perfect water sealing and improved wearing comfort NEW! - WATER_GATE_PLUS: All ION semidry wetsuits with long arms / long legs are equipped with a Water_Gate_Plus batwing panel on the inside of the back behind the zipper. It works like a water barrier to keep out the water which soaks through the back zipper. To improve the waterproofness even more, all ION batwings (except Capture) have an additional cuff extension like a collar worn over the head. On top of that the glued blind-stitched seam is covered with an extra Neoprene tape sealing to keep you dry and warm on the inside. - SEAL_TITE (COLLAR): New single layer collar construction for perfect water sealing and improved wearing comfort. The super smoothGlide_Skin on the inside collar avoids skin irritations and seals the neck perfectly without choking. On the outside an aditional S_Seal stripe on the collar rim (except entry level suits) reduces water intrusion and the increased collar height protects against cold water and wind-chill. - KEY_LOOP: All ION wetsuits are now equipped with a clever keypocket with elastic safety loop on your calf, arm or other places depending on the model (please only store water resistant keys in this pocket to avoid damage). - LEG_CLOSURE: Easy entry Velcro closure on the ankles. - TATEX_PROTECTORS: Highly abrasion resistant protection printings on the knee panels. Flex zones allow outstanding freedom of movement. - VELCRO_LEG LOOP: All ION wetsuits with long legs are provided with detachableVelcro_Leg_ Loops (except models with an integrated Velcro Closure on the legs for easy entry such as Quantum suits). This Loop can be wrapped tight around the ankle to increase waterproofness. To prevent losing theVelcro_Leg_ Loop on the water it has a special construction. Of course the Velcro Loop can also be removed easily by hand if not needed. The edges of the Neoprene panels are covered with a highly adhesive, UV resistant contact glue which needs to dry for a few minutes. Then the glue is applied a second time to make it more sticky. Now the corresponding edges of the Neoprene panels are put together by hand and then firmly squeezed with an electric pressing tool cm by cm to achieve the high tearing strength. After glueing, the seams are stitched on one side with a special blind-stitch sewing machine. A curved needle pokes through the neoprene layer (without actually poking through the Neoprene to the other side) and applies an elastic seam. If you can see the stitching only on one side of the seam then the suit is featured with GBS_Seamsing. By using this technique, the blind seam is highly tear proof, elastic and very much waterresistant to provide insulation and comfort. This manufacturing process is extremely complex and timeconsuming, and therefore very expensive. - GATE_KEEPER: When you put on a wetsuit with batwing construction just by yourself, the Water_Gate back panel tends to roll up inside and makes it hard to grab it without help. A Velcro patch on the upper part of the batwing makes it possible to fix the batwing on the neck closure. This prevents the Water_Gate back panel from rolling up inside and helps you grabbing it without the help of an assisting buddy. The Gate_Keeper Velcro patches on the batwing and neck closure are indicated in red color. - DRAIN_HOLES: All wetsuits with Water_Gate batwing panels have little holes on the lower back part. Water which enters through the back zipper can leak out easily and thereby the back area is kept dry. These Drain_Holes are also placed at the calves which prevent the water from getting stuck in the legs. - SEAM_REINFORCEMENTS: All crucial stress areas are reinforced either withMelco_Tape on the inside seams or rubber logo patches on the outside to prevent ripping. 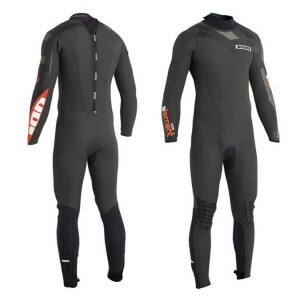 - CONTOUR_CUT: In order to improve mobility and comfort, all ION wetsuits come with Contour_Cut. It enhances the flexibility in collar, wrist, ellbow, instep and the hollow of the knee. - SUNGLASS_LOOP: A small webbing loop on the neck of wetsuits and all kind of Neoprene tops to attach safety line of ION sunglasses. - LIMESTONE_NEOPRENE: For years all ION Neoprene products like wetsuits, Neoprene tops and other Neoprene accessories where made of highly elastic certified Limestone_Neoprene from Japan. That means the raw materials (polychloroprene chips) are made of calcium carbite which is converted from limestone (calcium carbonate) instead of using Neoprene derived from petrolium oil like in the past. Although this production method uses a lot of energy in the electric arc furnaces where the limestone is processed, this energy derives from hydropower. Hydropower produces essentially no carbon dioxide or other harmful emissions, in contrast to burning fossil fuels, which significantly contributes to global warming through CO2. - S_TYPE NEOPRENE: ION wetsuits are all made of S_Type Neoprene which is one of the most elastic neoprene types on the market. It?s also very warm and lightweight due to its specific cell structure. - CYBER_SOFT: Improved even softer version of ION Cyber_Stretch jersey. Outstanding stretch combined with a smooth handfeel to die for. This new nylon jersey with a high percentage of elastic spandex filaments undergoes a specialized softening treatment. It provides an unparalleled soft touch and wearing comfort on bare skin compared to standard jerseys. NEW! - D_FENCE NYLON: Improved durable and resistant nylon jersey with great price performance ratio now comes in a nicer surface and smoother handfee!